I didn't realize how long it's been since our last wireless extender review, which was Linksys' RE6500 last September. It's purely coincidence that I'm looking at Linksys' latest wireless extender, the RE6700 AC1200 AMPLIFY Dual-Band Wi-Fi Range Extender today. 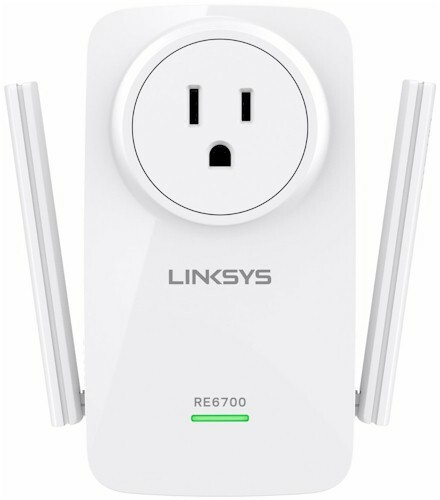 Like the RE6500, the RE6700 is a simultaneous dual-band AC1200 class wireless range extender that supports maximum link rates of 300 Mbps in the 2.4 GHz band and 867 Mbps in 5 GHz. The RE6700 also shares the RE6500's "Crossband" feature that uses the radio on one band as the "backhaul" to the router while the other radio connects to the client device. Crossband is enabled automatically if you have created connections on both the 2.4 GHz and the 5 GHz band to your dual-band router or access point. This eliminates the 50% retransmission and higher latency penalties imposed by single band extenders and dual-band extenders that don't have a similar feature. The callout diagram below shows the top, rear and bottom of the RE6700. The Linksys promo photo above shows the extender doesn't block the second outlet in a standard U.S. duplex outlet and shows the built-in AC power pass-through socket in use. The AC socket is pass-through only; it's neither filtered nor fused. Note the single front panel light changes color and blinks to indicate wireless connection quality. But Linksys also has a better method to aid in extender placement I'll touch on shortly. The single Ethernet port is Gigabit and the audio jack is meant to be used with powered speakers. The screenshot below is taken from this support article detailing supported music playback apps for Windows, MacOS, iOS and Android OSes. Linksys suppressed internal FCC photos until this fall, so I opened the RE6700 up after testing was completed. The image below shows the view after removing the front cover. There is a lot crammed into a pretty small space, so there is generous heatsinking, which is needed to handle the heat generated by the two radio SoCs. The black plate is a heatsink that couples via a thermal pad to the RF can below it for the 5 GHz radio. The metal strips surrounding the pass-through power socket are tied to a plate that is heatsinking the main board bottom side components. The RAM, wireless SoCs and power amplifiers are all coupled to their respective RF can tops via thermal pads, which are in turn coupled to heatsink plates with pads. The gallery below has other internal pictures. The table below compares the major components of the Linksys RE6700, Linksys RE6500 and NETGEAR EX6100 dual band wireless range extenders. The NETGEAR is AC750 vs. AC1200 for both Linksyses. According to WikiDevi, the Mediatek MT7621AT has a dual-core MIPS32 processor clocked at 880 MHz, while the MT7620A has a single-core 32 bit MIPS processor clocked at 580 MHz. Black plate is heatsink. Black foam appear to be light blockers. Heatsink and RF can cover removed. Mediatek MT7612EN 2x2 11ac radio at middle left, Realtek RTL8211E to right. Winbond flash lower center. Mainboard removed to show bottom heatsinking. Note the copper-colored metal strips that couple to more heatsinking surrounding power outlet. Closeup of main board top. Inside with main board removed.Built-in power supply components lie under the plastic shield. The small connector at middle right brings DC power to the main board.